This investigation asks students to develop a hypothesis about how quickly an effervescent tablet will dissolve. This lab is intended for beginners and walks students through the steps they would need to take to answer the experimental question. 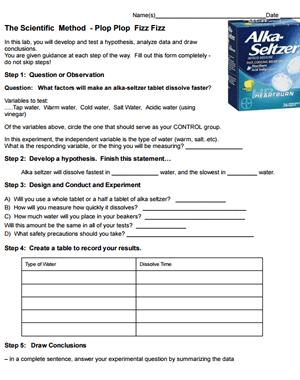 When designing the experiment, students are asked to consider variables, like how much water to put into the backer, and how they will gather data. A data table is included that for students to complete and a final question asks students to write in a complete sentence, what happened in the experiment and specify which variables affect the speed the tablet dissolves.